This high-end monthly publication is compelling and attractive in design, as well as thought-provoking and entertaining in concept. 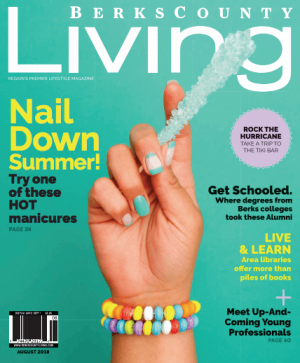 Berks County Living was created to be the signature publication for Berks County, PA and to provide advertisers the opportunity to reach the hottest demographic groups in the area – through a truly upscale, full-color format. We are a niche magazine that reaches Berks’ high-end consumers and big-business spenders. Berks County Living readers have the income to support luxury items, finer homes and interiors, regular dining out and active lifestyles. Engaging editorial paired with high-quality production and a generous use of color makes this lifestyle magazine your link to the most affluent, distinct members of Berks County. It is our pleasure to open the door to Berks County. Together we can make Berks County Living the tool you’ve been looking for to increase your business’s profitability.